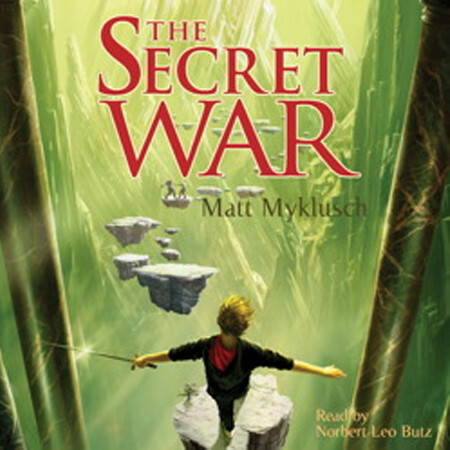 The Secret War - Audiobook | Listen Instantly! Jack is trying to find out how far the RÜstov sleeper virus has spread, working to find a cure, and striving to avoid the dire future that Revile warned him about. Meanwhile, Jonas Smart is working just as hard to discover what Jack is hiding from everyone. When a rogue Secreteer—the protectors of Imagine Nation citizens’ secrets—starts selling info to the highest bidder, Smart is ready and waiting. If Jack is going to help prevent a second RÜstov invasion, keep Smart from discovering his secrets, and find out what a shadowy, half-mad Secreteer knows about his long-lost father, he’ll need to learn to trust his friends and find the true path toward becoming a hero himself. Download and start listening now!
" I can't wait to read the next book. It comes out in August. This one I liked better than the first one because the first one began in a boy's home. I don't really like that setting. it seems a bit over used. But this book was good. " " The Secret War is a great book. It takes place on the Imagination Nation. It is a fantasy and sci-fi book. I would recommend this book to anyone who likes either of those two genres. Jack needs to find a cure before the Rustov Invasion. The Rustov invasion will happen in three days unless Jack can stop it. He must protect the Mechas. In conclusion The Secret War is an excellent book. " " A great read, full of good clean action. This will be one I will recommend to the kids in a few years. " " Fun clean good series, for youth and adults. I read the first book before my husband then he found this next book and read itand the third. I'm now on the 3rd myself. Excellent fun series. " " This story revolves around Jack Blank and as he lose the trust anyone ever gave him in the previous books. This book began with Jack as a well liked person in the city he resides in but as the book went on he kept telling lies to patch up his secret. First of all he told basically no one about his dark secret in order to stop a riot from happening or at least that was what he thought but his secret just got everyone angry and suspicious of him. When he was on the edge of telling his secret out he told another secret that he kept, that was slightly less significant. That caused a lot of people to be hurt but it lessen his suspicious-ness by a little when he told everyone or the important people that secret. Near the end of the book he finally told his biggest secret and the reaction from the people was exactly what he expected ti to be, but he felt relieve now that his secret was out and that he doesn't have to be guilty of anything anymore, that taught him that he can tell his secrets to his friends and trust them with it. The author's style is easy to understand, but in this book it seem like he wrote it with less enthusiasm than the first book which was a more descriptive and interseting/ "
" I thought that it was highly entertaining with many twists and turns "
" I liked this one better than the first book. Jack has a lot to deal with by trying to develop a cure for the computer virus and trying to keep his secrets from coming out. However, it does leave you anxious for the 3rd book. It's a good old fashion superhero book. " " This series is all about super heroes. You have to really like super heroes. " " It was pretty good ,they describe the war really well! You guy's should really read it! I like it when Jack Blank killed the god of war. The final war was so EPIC! I can picture the war inside of my mind. The book look like it was in real world. " " I thought it was going to be boring because it really was at first but after the half of the book, it got really interesting because there was more action! I think the author wanted to explain more about Jack's parasite inside and how it is really hard to keep lying to his friends. " " Oh, Jack...what troubles your secrets get you into! While the first book was superior to this book in terms of its characters and character growth, the storyline was just as exciting. The setting! That ending! And (view spoiler)[ JAZEN!! (hide spoiler)] Can't wait to read Jack's next adventure! " " My 13-year-old loves this series so much, he read this book at Barns & Noble for an hour because we were still waiting to get it from the library. :) "
" This was better than the first, it starts off right where it left off, it even has a surprise ending "
" Jack's adventure is even better this time. " " Amazing. I loved the suspense and how I could never quite figure out exactly what was going to happen. " " I'm still at the beginning of the story, but I enjoying the way the author is building the relationships between Jack and his friends. " Matt Myklusch has been obsessed with comic books and superheroes since he was five years old. This lifelong love sparked his Jack Blank series. Before starting the series, he worked for about ten years at MTV Networks, during which time he was responsible for booking and producing celebrity interviews, assisting in the launch mtvU—their twenty-four hour college network—and managing spring break events in Cancun, Acapulco, and Panama City beach. He lives in New Jersey with his wife and family, where he is hard at work on the next book in the Jack Blank series. Norbert Leo Butz is an American actor, singer, and narrator best known for his work in Broadway theater. He is a two-time winner of the Tony Award for Best Actor in a Musical and is one of only nine actors ever to have won the award twice as lead actor.